At the ASecureLife office, we’re always looking for new ways to make our lives a little more secure, which is why we were excited when EyePatch reached out to us about their new product: a phone case with built-in camera covers. Unlike the camera covers we’ve reviewed in the past, EyePatch focuses solely on phone cameras, in lieu of making camera covers that are adaptable to both phones and webcams. We had the chance to conduct a hands-on test of the EyePatch Case at our office over the last few weeks. 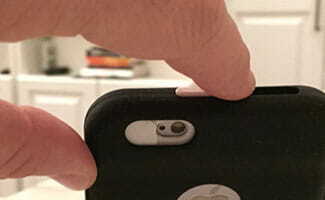 The product is a silicone case, with a built-in switch that cleans your front camera when used. While the EyePatch Case is effective, it is a little bulky and there’s not a lot of “style” to it. It is currently only compatible with the iPhone 5/5S or 6/6S — we reached out to EyePatch though, and there are plans to release models for some of the popular Android phones. We think with a few future improvements, this could be a really solid option for those concerned with camera security (read: NSA monitoring). Summary : The EyePatch camera case is a great idea, and we're excited to see the updates their team has planned come to fruition, but unless you have an iPhone 5/5s or 6/6s and aren't concerned with webcams and other devices, it might make more sense to go with a stick-on camera cover. Currently, the EyePatch Case comes in three colors: white, black, and purple. The slider comes standard in white, but you can get it in yellow, blue, pink, or black for an extra $4.99 — exclusive to the iPhone 5/5S. The EyePatch Case is currently is available for iPhone 5/5S and 6/6S, but not the 6 Plus. If you’re rocking an Android or older iPhone model, you will not be able to use this product, yet — EyePatch Case has confirmed, however, that they do have plans to release versions of their product for some of the more popular Android devices, starting with the Samsung Galaxy series. Would we recommend the Eye Patch case? The EyePatch Case is a good idea, but it still needs some work. We’re not sure we would be willing to sacrifice the lightweight feel of our phones for the bulky case. If the design were more sleek and stylish, or if we could add a small device to our existing case, we might reconsider. The good news: EyePatch Case has done a great job of listening to its customers’ feedback and is making improvements for a better product. They’re looking to up the style factor and increase durability while adding a wider variety of colors and a hard plastic shell — they also hinted at a version with a wallet built in.